A clean guitar sound, first heard dry, and then with Manifold slowly mixed in. Manifold is set to add a number of slightly detuned voices widely spaced around the stereo panorama. The Manifold voices are slightly highpassed (using Manifold's filter) to remove the accented low frequencies. This demo uses a very simple Aspect patch (a single sawtooth oscillator with no filter) playing a string quartet style chord progression. First, the raw Aspect sound is heard, and then we introduce Manifold. The twenty additional detuned voices that Manifold adds makes the synthetic sawtooth string patch sound much fuller. Manifold's lowpass filter is automated to open and bring in additional high frequencies with each chord's crescendo. 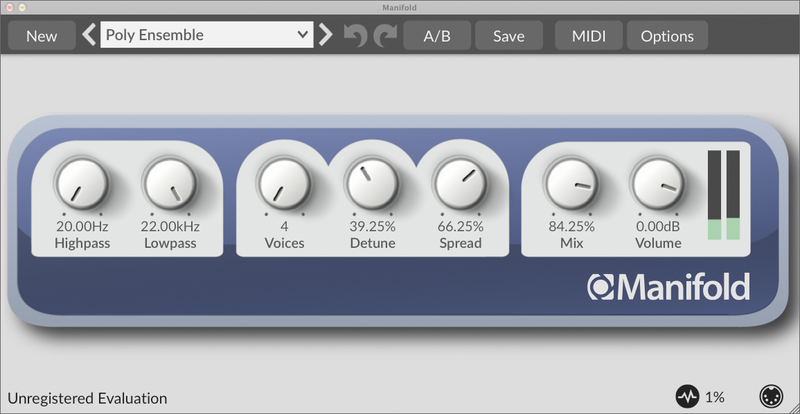 Manifold is available for macOS, Windows, and Linux, in AAX, Audio Unit, VST plugin, RTAS and Standalone application formats. Native 64-bit versions available for macOS AAX, Audio Unit and VST; Windows AAX and VST; and Linux. Output will be periodically interrupted, approximately every 20 seconds, by a short moment of silence. Buying a Manifold licence directly from us currently entitles you to lifetime free updates for Manifold.